Sports Medicine | Dr. Melissa Lee ND., RAc. As an athlete, performing at your peak level is more than just having the best equipment, the best training, or achieving a high fitness level. It’s about total health resulting in excellent performance regardless of the level of sport you practice/compete in. 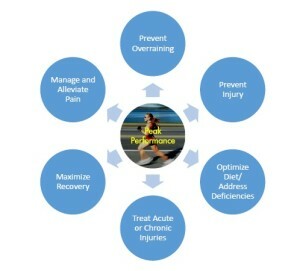 Sports performance optimization has become a primary focus of many athletes. Thinking about and developing a plan on how to support your body specific to your individual and athletic needs is an important aspect of performance optimization. What can Naturopathic Medicine Offer Me? We all know that an athlete’s fuel is their food. What an athlete eats is crucial to how they will train, perform, recover and refuel. It is important not only consume the right vitamins, minerals and nutrients in the form of food, but it is also important to ensure that foods are being well processed by the body. An ND can help you improve your nutrition status and ensure you are absorbing and utilizing all nutrients. Tight muscles? Neck/Shoulder/Hip/Shin Pain? Limited range of motion? Bones, muscles, ligaments and tendons all make up the physical structure of the body and often are sources of imbalance. Ongoing Naturopathic therapies like herbal medicine, acupuncture, intramuscular stimulation will help address pain, address current injuries, improve recovery time, and prevent future injuries. When NDs are working on a specific injury, they can use their therapies to help athletes increase awareness of fine muscle movement and control. With intense training, athletes are more susceptible to becoming bogged down colds, flus and infections. An ND can help an athlete strengthen their immune system to treat and prevent infection. A lot of training is focused solely on the physical. An ND can work with an athlete to achieve mental, emotional and spiritual health. When this is in balance athletes are less distracted and able to focus on training and competing. Are you ready to take your training to the next step?